Russell Springs, KY - 3/31 - A "Family Tradition" continues in 2003 as Team Selby Motorsports and driver Dennis Selby get set to compete in Dirt Late Model action in the Central Kentucky region. The 37 year-old, second generation chauffer for Team Selby Racing is headed into 2003 with the best program of his racing career at his disposal. The team will once again use MasterSbilt Race Cars, but have incorporated a mighty Cornett Race Engine to breath life into the entry, which will carry Team Selby Motorsports traditional number 46 on its doors. 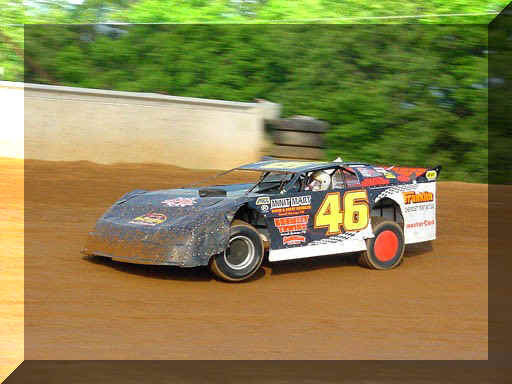 The 2002 race season saw a steady rise in the Team Selby Motorsports Dirt Late Model program. Although there were no feature race checkered flags, driver Dennis Selby proved a mark of consistency in the 34 event the team competed in during the season with 26 top ten feature finishes, with 12 top five feature runs. The goal of Team Selby Motorsports during the 2003 racing season is to win the 2003 Late Model track championship at Bluegrass Speedway, located in Bardstown, KY, where Team Selby Motorsports will make their 2003 on-track debut on April 19. This track was the sight of the 2002 Dirt Track World Championship and has quickly gained a reputation in the Dirt Late Model industry as being the sight of some of Kentucky's best weekly competition, with proof in the pudding so to speak as there were 13 different feature winners in 17 Late Model events at the ½ mile oval in 2001 and 2002. Team Selby Motorsports will begin the 2003 racing season with the 2003 Season Opener at Bluegrass Speedway in Bardstown, KY. Returning as vital players for Team Selby in 2003 are crew chief Dwight Terry, along with crew members Eric Selby, Evan Selby, Matthew Selby, Danny Terry, and Joshua Terry. Providing sponsorship on the Team Selby Motorsports #46 MasterSbilt Race Cars entry are Franklin Motors of Columbia, KY, NIDCO Tools of St. Louis, MO, and Dukes A and W Car and Truck Accessories of Louisville, KY.